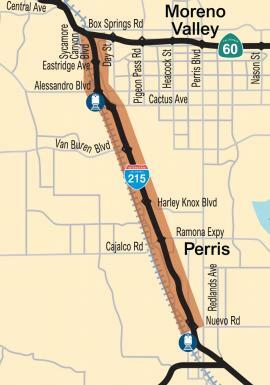 RCTC proposes to widen a 10.75-mile section of Interstate 215 from Nuevo Road in Perris to the 60/215 Interchange in Riverside. One carpool lane is proposed to be added to I-215 in both directions, as well as a westbound auxiliary lane to improve traffic merging onto SR-60. RCTC gave priority to the I-215 South and I-215 Central Projects, because the freeway was only two lanes in both directions in those areas. The existing 46-foot freeway median could be used for some of this widening project, but some outside widening would be required to accommodate the carpool lanes. Using the median to the greatest extent possible will reduce impacts to homes and businesses. In addition, the project proposes to add an auxiliary lane to westbound SR-60 between the I-215/SR-60 junction and the SR-60/Day Street Interchange. This auxiliary lane will help with traffic merging along this heavily used section of freeway.